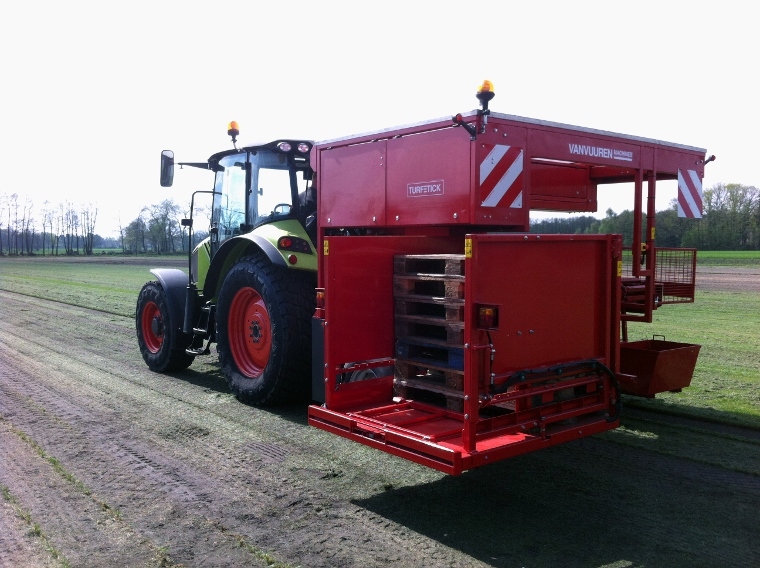 The Turf Tick Universal Stacker, based on the familiar Turf Tick sod harvester comes with a reel floating head design, the cutting head pivots independently from the conveyor. Entirely open design with low weight pivot point. The Counter balanced cutting blade drive ensures low noise and low vibration. Hydraulicall depth control as standard. A fully automatic stacking machine designed to meet the latest industry requirements. This machine has a working width of 16” for pallet sizes of 0.80 x 1.20m / 1.00m x 1.20m / 1.20 x 1.20m ( 48” x 48”) and can stack in any pattern. Suitable for 4WD tractors from 75HP. 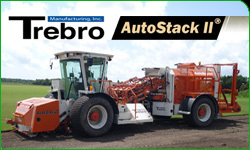 The automatic stacking machine can be offered with or without tractor. The harvester is equipped with a coulter disc assembly and special reversible blade and roll control ™ and rear steered wheel. The rotary brush (hydraulically speed control) is mounted in the front.